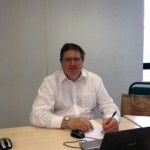 My name is Paul Mills and I am the Training and Development Manager for Hilton. I have over thirty years’ experience working in Learning Disabilities. I started my career as a Support Worker way back in the early 80’s before training and qualifying as a nurse for people with Learning Disabilities in 1988. In this role I have worked as a Staff Nurse and Deputy Charge Nurse in Residential Services as well as working as a Charge Nurse in both Adult and Children’s Learning Disabilities Community Teams. In 1999 after completing my Bachelor’s degree in Community Nursing Practices I became a lecturer at Suffolk College. (Later to become University Campus Suffolk (UCS)) and in 2005 after completing my Master’s Degree in Education, I was appointed Senior Lecturer in Learning Disability Nursing at UCS. I left the University in 2009 so that I could return to working directly with people with learning disabilities. I became a Home Manager for a private residential care company running a bungalow for eight adults with learning disabilities and severe challenging behaviours. In this role I was able to use all my teaching and academic experience to train and educate my team and enable them to become more confident and skilled in performing their role. Something I hope I have continued to do today with our staff from Hilton. I have been in my post of Training & Development Manager since it was first developed back in 2010 with the aim of championing the training and development of all staff in the organisation. My role mostly centres on the delivery of mandatory training, service-specific training, training targeted at individual Tenant’s needs, and support and practice related training to over 300 employees working for Hilton. Training covers a wide variety of subject areas including Health & Safety, Food Hygiene, Risk Assessment, Appointed Person’s First Aid, Abuse Awareness, COSHH, Report Writing, Person Centred Planning and Medication Training amongst others. Another significant part of my role is to create a learning culture which results in measurable outcomes for Tenants/Service Users and the ongoing development of the organisation as a whole. This has included heading up our successful application in 2010 to achieve the Standard Award with Investors in People. I have also played a major part in our successful application to become an approved Training Centre with the Open College Network (OCN), City and Guilds and Pearson Educational (formally EDI) with whom we run the Quality Credit Framework Award (QCF) in Health and Social Care. I am one of the five senior managers at Hilton who are qualified assessors. Together we offer our staff the QCF Award in Health & Social Care at Levels 2 and 3. I am also the lead Dignity Champion for Hilton and a Dignity Champion with the Dignity in Care Network, supported by the Social Care Institute for Excellence. I enjoy my role very much. I find the great variety and scope it demands to be both challenging and rewarding. I particularly enjoy meeting and working with the staff and Tenants from each of our three regions as well as my colleagues from Head Office. Being in a position where I can get to know everyone at Hilton is a great feeling and a privilege. I love the relaxed atmosphere and general informality that the company has cultivated as I find that it reflects back onto the staff and Tenants to create, what I consider to be, a very caring and devoted body of people within a hugely supportive and forward thinking organisation.